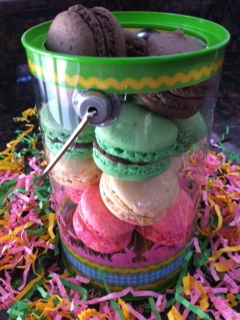 A piece of Heaven in a little thing called Macaron! 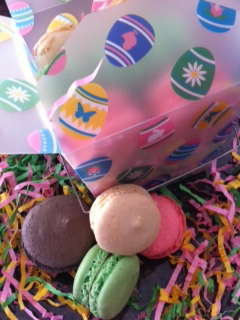 Have you tried those little dessert called Macarons? They are those cute little circular meringues-like cookies that have amazing colors? Well, if you have not, you must… they are so so good!!! They will surprise you for for their amazing taste, and by their texture; so crisp on the outside and yet so smooth on the inside. You may think that it is so sweet, being a meringue-like cookie but it is not. It is just the right sweetness, not too overwhelming. 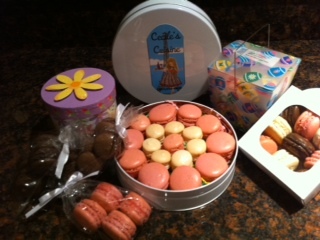 For those who do not know what Macarons are, they are a French little petit four. They are made with egg whites, icing sugar, granulated sugar, almond powder and food coloring. Each one of them have a different color and a different flavor. Each color equates a flavor: green for pistachio oo lime of mint, red for strawberry, purple red for rasberry, and I could keep on going. 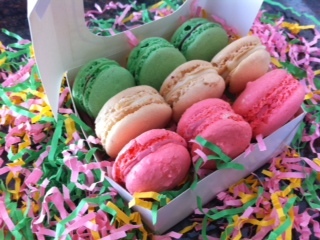 The colors of those little things, just like their flavors are endless…. Well those little confectioneries are available at the Deli Korner on Fernwood Road in Spartanburg every Thursday through Saturday. They have them in various flavors: vanilla, choco-mint, raspberry, and choco. If you desire to order some for a special occasion, or you want a different flavor, you may place an order at the deli Korner, call me at 864-4894-4494 or send me an e-mail at cecile.cuisin@yahoo.com. I hope to hear from you…. Think about Easter! They would be the perfect gift!